It’s hard to believe that it has already been a month and a half. That just goes to show that time flies in another country. In the field of research I am still in the stages of building contacts that work with Nicaraguan youth and voter participation. What I have found out so far about research here is that many people are more than willing to give an hour or so of their time to talk. I also have discovered that Nicaragua is an incredibly polarized country, making it even more important to gather information from both sides of the spectrum. For example I spoke to one organization that is notoriously anti-government that gave me a long explanation on the issues of getting a national i.d. card. On the other hand, a young adult I spoke to from the Sandinista Youth, Nicaragua’s ruling political party told me they do not see an issue with getting an i.d. card. It is both frustrating and interesting to see the varying perspectives of the locals with respect to civic engagement. As important as it is to have various opinions, I wonder if those with different perspectives can learn to work together. In the coming months I look forward to speak with young adults from a variety of educational, political, and socioeconomic backgrounds about their level of civic engagement. Another part of Fulbright is getting out and exploring what the host country has to offer. Therefore, this past weekend I got out of the hustling and bustling city of Managua and headed to the much more tranquil León, about an hour north. A friend of mine from university lived in Nicaragua many years, so she put me in touch with her cousin who lives there. I got in Friday afternoon and immediately noticed the sharp contrast between Managua and León. For one thing Managua is a crowded, capital city that is almost impossible to navigate on foot. León is a quaint, colonial city with the loudest noise being the church bells of the cathedral. This probably explains why there were a lot more tourists there. I swear, I saw more tourists within the first five minutes in Leon than I had my whole month and a half in Managua. After wandering around a bit, I met up with my friend’s cousin and we relaxed at a restaurant in the main plaza for the afternoon. Later, we met up with a friend of hers who was also visiting from the States, and we grabbed dinner at a Mexican restaurant. It still wasn’t the Mexican food I’m used to in California, but it was close enough. At night we went out to a bar with live music. They made a slight effort at reminding the patrons it was Halloween by hanging inflatable spiders and cobwebs. The bartender also had a skeleton mask on. However, Halloween is not really celebrated here, so this may have been to appeal to foreigners. Afterwards, we went to a nightclub that was on the more upscale side. There was even a cover charge and VIP area. Even still, a night out on the town in Nicaragua is much more economical than, say, Los Angeles. The check for our whole group was less than the price what one person’s drinks in the U.S would be! I’m in for a rude awakening when I come back… They also played a good mix of American and Latin American music. The DJ clearly loved the sound of his own voice because he seemed to make announcements every five minutes over the loudspeaker. We would be really into the song and suddenly hear Sábadooo noche! (Saturday night! ), followed by some announcement about a costume contest the next day. Despite Sir Talks-a-Lot we had a lot of fun. The next day we had a late start and met up for lunchtime by the beach. 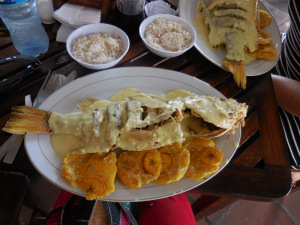 I ate fried fish…with the head and eyes and everything! It was covered in some garlic sauce which made it very tasty. In the afternoon I took a solo adventure to El Museo de Cuentos y Leyendas or the Stories and Legends Museum. This museum actually used to be a torture prison during the Somoza dictatorship. The original buildings and guard towers are still intact. 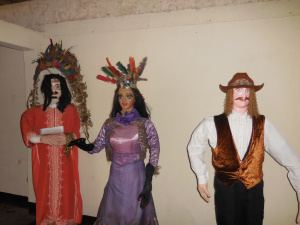 Now, it is a museum dedicated to popular Nicaraguan myths and stories. I had a museum guide show me around and explain each story. They had life size statues of the characters depicted in a series of rooms. Some stories are told to children to make them listen to their parents, because a few of the characters rob children. Other stories were clearly in response to the Spanish Conquistadores. For example, one woman was seduced by a Spaniard who actually only wanted her father’s gold. After finding out where the riches were he trapped her in a cave. Now, legend has it her spirit will seek out foreign men, seduce them, and trap them in a cave. I would say about 70% of the stories the guide told me had to do with women seeking revenge. Moral of the story(or stories that is)…don’t mess with the wrong woman. On Saturday night we had dinner at my friend’s house with a few of her family members and friends. They made amazing homemade chicken and guacamole. After dinner we played a few rounds of Heads Up, the charade-like game on the iPhone. A few times there was a mix up in translations or cultural references, which made the game even more entertaining. The rest of the day was pretty laid back, since everything is closed on Sunday. We had lunch at a restaurant called Carnivore or Carnívoro. I finally had a burger and fries I had been craving ever since I got here. Then, we parted ways and I got on the bus back to Managua. Overall, it was a really relaxing weekend in León and it definitely won’t be my last. I was asked on multiple occasions “So…when are you coming back to León?” Soon I hope! You are currently browsing the Scholarship Opportunities Program blog archives for November, 2014.